Jose and Cynthia’s passion for travelling the world was their inspiration for a destination wedding in breathtaking Santorini. “After many days of thinking and talking Jose and Cynthia decided to get married in Santorini and also took the opportunity to invite all their guest to to travel with them and embark in a journey of 15 days in a Royal Caribbean cruise… traveling all around the mediterranean sea. They came in Santorini just for some hours with cruise ship. Cynthia is from New York and Jose from Miami. As soon as we met them, we were super excited and couldn’t wait to go out there and film their wedding! Jose was trying to help us from every detail, he brought with him a small statue to capture the rings and some other smaller statues for the decoration table. Their wedding centered around a few of their close family and friends who were truly elated to see the union of this lovely couple. Jose and Cynthia had their wedding ceremony and reception in the beautiful and awesome hotel called Dana Villas, with the most beautiful background with Caldera in the world, in Santorini island. Also the planning and the time schedule was so well organized from Michael Gierkovits that everyone enjoyed this. Well… it is a great pleasure for us to present this wedding film of our newlywed Jose & Cynthia. They are not only such sweet couple, but also very fun and easy going! 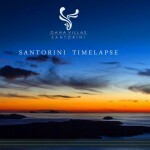 Enjoy the beauties of Santorini!!! 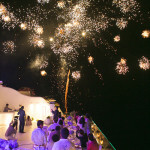 “The most beautiful stop and destination during our cruise was Santorini, were the wedding took place. We LOVE to travel, thats why our wedding theme was “Wedding-moon under the Mediterranean sea” mixing the wedding day and the honey moon. We wanted to give to our guests an experience and a piece of memory from every city visited, so we gave a Treasure Box with special authentic things from every country. Cynthia and Jose, from all of us here at Dana Villas we wish to thank you for honoring us by having your most special day in Dana Villas. We wish you all the happiness in the world and we look forward to seieng you again on our beautiful island.